How to differentiate between DAP and DDU under Inco terms? One of the most common doubts among terms of delivery under Inco Terms is about DDU Vs. DAP. Is there any difference between DDU and DAP terms? What is DAP terms? How does DDU term work? How to differentiate DAP with DDU? A confusion on terms of delivery DDU and DAP may arise among some of the traders in business industry. DDU and DAP terms are two of delivery terms used in business, especially in international trade. Let us discuss about DDU terms. How does DDU term work? DDU term has been being used under International Commercial Terms 2000 guided line by International Chamber of Commerce. DDU means, Delivered Duty Unpaid (followed by a destination name). For example, DDU Bangalore means, the seller needs to deliver goods to the buyer up to the destination (Bangalore) mentioned in contract. Bangalore is a place in India about 350 kilo meters away from Chennai Sea port. Under DDU terms, the seller’s obligation is to deliver goods to buyer up to Bangalore. As mentioned under DDU terms, the duty and taxes at importing country has to be met by the buyer (importer). All other expenses of carriage, insurance, customs clearance, and other expenses up to the place (Bangalore) need to be spent by the seller of goods. You can also read DDU terms in details in this website. When revising the terms of delivery in Inco Terms 2010, the said DDU terms has been omitted and introduced a new term called DAP. DAP means Delivered At Place (followed with a destination name). For example DAP Bangalore. DAP Bangalore means, all responsibilities with costs except duty and taxes and customs clearance at importing country to deliver goods to buyer at the destination place (‘Bangalore’ in this example) is vested with the seller. Means, under DAP terms, the responsibility to meet customs clearance with duty and taxes at importing country is with the buyer. I hope, I could clarify the difference between DAP and DDU. Do you have different thoughts on DDU and DAP? Discuss below your experience and thoughts on DAP Vs. DDU. CNF,C&F or CFR. Which term is correct. bahrami: On 14 September 2013 Dear sirs thanks for apply to us meaning of DDU and DAP. May i kindly request ,whether DAP term has been substituted to DDU,and we should not use this term(DDU)forever. awaiting your prompt reply to my email please donot hesitate to contact my email if you donot understand my question. best regards bahrami. surendran: On 13 November 2013 The characteristics of DAP and DDU are almost similar. As mentioned in the article, both DDU and DAP can be used. However, you need to specifically mention in contract that terms of delivery is 'DDU as per Incoterms 2000' or 'DAP as per Incoterms 2010'. Vikas Gola: On 31 January 2014 yes very useful website and i found what am searching for..
SWASTI DUBEY: On 04 March 2014 VERY NICE EXPLANATION. jaanaka: On 10 March 2014 PLease interchange the seller and buyer: DAP Bangalore means, all responsibilities with costs except duty and taxes at importing country to deliver goods to seller at the destination place (‘Bangalore’ in this example) is vested with the buyer. Surendran Kollerath: On 10 March 2014 Hi Jaanaka, Thank you for pointing out this error. Thanks once again for your support to this web site. 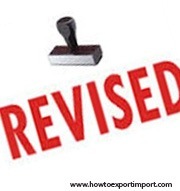 Bala: On 16 December 2014 Excellent news and guidelines by the author on aspects of export.Especially starters. milind bhandakkar: On 19 April 2015 Can raw material imported for production of finished goods be considered for High Sea Sales, if value of such imported raw material is clearly identified in the order/ contract signed between saler & buyer. Crystal: On 28 May 2015 If an Importer buys good from a supplier where DAP/DDU terms are used, does the Importer still have to file an ISF? Asawanee: On 19 April 2017 So For DAP custom clearance in import country will pay by buyer right? Becky: On 15 June 2017 One more difference between DAP and DDU is that DAP was intended not only to replace DDU but also, DES and DAF. Therefore, an exporter may use DAP with a named port and not be responsible for terminal charges or inland freight.